Mazda today unveiled its fourth generation MX-5 at simultaneous events across the World, staged in Japan, the USA and Spain. With a distinctive adaptation of Mazda's KODO - Soul of Motion design, the new car goes on sale in Europe in 2015. The all-new MX-5 features ultra-efficient SKYACTIV technology, including specially tuned SKYACTIV-G petrol engines and the first rear-wheel drive version of the SKYACTIV-Chassis. Weighing 100kg less than the outgoing model and with the lowest-ever centre of gravity, thelatest incarnation of Mazda's iconic roadster enhances the Jinba Ittai "rider-and-horse-as one" responsiveness and agility that has always made the MX-5 the essence of driving fun. 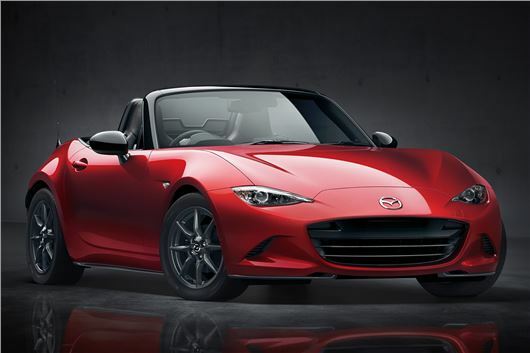 The weight reduction also puts the new Mazda MX-5 at a level comparable to the original model, which revived and revolutionised the market for affordable lightweight sports cars back in 1989. More than 947,000 MX-5s have been produced over the past 25 years, and the MX-5 holds the Guinness World Record as the all-time bestselling two-seater sports car. "Mazda's current win streak is driven by our highly acclaimed new models, and the all-new MX-5 should only add fuel to the growth engine," says Mazda Motor Europe President and CEO Jeff Guyton. "Built for the love of driving, this car underscores what Mazda is all about. It will certainly give our brand an added boost."